Global Marine Technologies Inc. is a highly renowned Oilfield Product Manufacturing & Service Provider Company nurtured by a professional team of engineers & backed by a strong team. The team is a family like work force of 370 skilled members who work in the diverse fields from idea development to concept to product development & is committed to the achievement of the most impossible results. 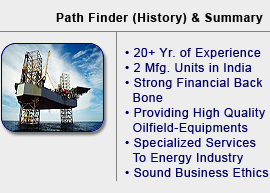 We, at Global Marine Technologies Inc (GMT) are technically qualified to meet & cater to all the day-to-day challenges faced by our esteemed clients, in the multifaceted fields of Oilfield Engineering: Oil & Gas Exploration: Offshore & Onshore Oil & Gas Industry worldwide. Having manufacturing units at Ghogha, Hazira in Gujarat & Navi Mumbai – Maharashtra and yards & warehouses at India’s most strategic locations & ports Pipavav, Bhavnagar, Ahmedabad, Baroda, Surat, Hazira, Mumbai, Chennai, Kakinada, Vizag, Cochin, Barmer (Rajasthan), we provide one of the broadest ranges of Products & Services for the Oil & Gas Industry & total support from these locations. 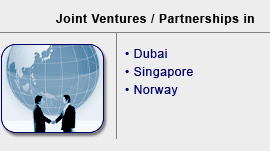 We take also pride in strong joint venture partnership in Dubai, Singapore & Norway. GMT is respected in the Oil field business for its reliability, commitment and is known for its execution of many turnkey onshore and offshore projects for being timely, successful and safe manner. The optimum utilization of our team who are experienced in the multifaceted areas of the Oil and Gas Industry worldwide for our clients, with specific solutions for challenges faced by them at different locations and extreme environmental conditions. Today’s GMT is a staunch believer in sound business ethics, dedication to customer’s demands & unconventional approach & attitude towards situations to convert challenges in to opportunities for committed result. Attaining harmony by involving client’s employees & ensuring a caring attitude by bringing in each member together in every process of progress & forming a unique team force momentum is what we continuously strive for. From a strategic perspective, GMT has two objectives: constantly striving for optimum growth through quality excellence, & commitment to reliability. We have the reputation of being a “Black Stallion” because we provide precise quality products & services each time, every time. 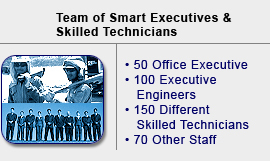 We take pride in our strong team of brains & brawn in our executives & technical team constantly striving towards greater individual productivity levels through intensive recruiting, training & performance evaluation, monitoring & maintaining honesty, health & harmony with appropriate appreciation. addlit Copyrights© Global Marine Technologies Inc.